Are you asking yourself why these blondies are called “healthy”? The secret ingredient is garbanzo beans! This may sound strange, but you can’t taste the actual beans in these blondies. They still have a little butter, sugar, eggs, and flour, but less of the bad stuff. The beans give them a moist, chewy consistency while the other ingredients mask the taste. Adding beans and blending them into the blondie batter is a great way to add fiber and protein to these delicious bars. 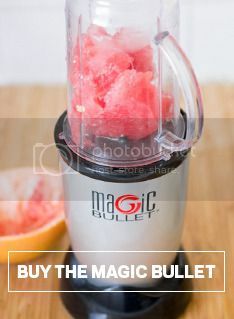 Add all ingredients to a Magic Bullet pitcher and blend. Stir in nuts with a spatula and transfer to an 8×8 baking dish. Bake for 30 minutes, then cool before cutting.